Antarctica: massive, majestic, mysterious. Only the brave dare to journey to this continent isolated from the rest of the world by imposingly icy waters. If you have a sense of adventure, a thirst for the unknown, and a passion for nature, this 15-day Antarctica cruise into the strikingly beautiful Antarctic Circle is for you. Departing from Ushuaia, Argentina, you’ll cruise across the famous Drake Passage toward the Antarctic Peninsula. In this relatively unexplored and unknown tip of the world—where harsh conditions prevent any permanent human settlement—several animal species thrive. Either on a land excursion or from the comfort of your modern cruise ship, you’re likely to spot large colonies of penguins, seal, and sea lions, or maybe one of the several types of whales that also call this stunningly severe, yet beautiful, region home. Welcome to the bottom of the world! Ushuaia in Argentina is the southernmost city in the world, but tomorrow you’ll head even further south on this once-in-a-lifetime Antarctica expedition. Today you’ll explore the magnificent Tierra del Fuego National Park on a professionally guided Ushuaia tour. The park is a mix of forests, glaciers, and mountains, providing an interesting contrast to the watery wonders you’ll see later in the day. After the tour you’ll be treated to a traditional Argentine barbeque, locally called an asado. Fill up on the tasty meats for which Argentina is so famous. In the afternoon you’ll be taken to the cruise ship to begin your Antarctica cruise. After an introduction to the crew and settling in your comfortable cabin, you’ll head out to sea, sailing through the Beagle Channel. Your cruise to Antarctica starts with a journey across the famous Drake Passage. This strip of water separates Patagonia from Antarctica and is named after the infamous 16th century English pirate Sir Francis Drake. Onboard naturalists will share their expertise of the area’s geography, history, and wildlife with you as you cruise further away from Argentina. On day 4 you will likely catch your first glimpse of the South Shetland Islands, 75 miles from the main Antarctic continent. All cruises have flexible itinerates to account for unexpected weather conditions, but upon arrival to the South Shetland Islands you will likely be able to debark and enjoy several unique off-board excursions. Options include exploring the beaches populated by penguins, fur seals, and elephant seals for an up-close look at wildlife; visiting a research center (the only type of human civilization in this frigid region); and enjoying the unexpected warmth of Pendulum Cove, one the calmest harbors in the region and a novelty due to its geothermal waters. For the next 2 days, you’ll cruise along the shores of the Antarctic Peninsula. You’re likely to see varied marine wildlife including penguins (Gentoo, Chinstrap, and Adelie), seals (Weddell, crabeater, and leopard), and whales (killer, humpback, and Minke). Once again, cruises itinerates are flexible, but you may visit Paradise Bay and the Neko Harbor. You could also cruise through the Neumayer and Lemaire Channels, narrow passages walled by towering rock faces and imposing glaciers. This is one of the most gorgeous areas in the entire world. You will have multiple opportunities to disembark and explore the region on foot, though where and when depends on weather conditions. Cruise staff will announce excursions as there are decided. Remember that each night you’ll be able to relax in your cabin, cuddle up with a book in the library, or mingle with your fellow guests in common areas. Often ship staff will host movies or other activities. By now you’ll have crossed latitude line 61°S into the Antarctic Circle, an imposing and isolated region that is the true bottom of the world. The entire ship will celebrate this crossing with a champagne toast. You’ll continue to have various opportunities to disembark and enjoy exciting on-shore Antarctica expeditions. Keep an eye out for tabular icebergs, the most common type of iceberg in this region, characterized by their plateau-like shape. The largest iceberg ever recorded was an Antarctic tabular iceberg— larger than Belgium. Also try to spot iceberg graveyards, which are areas in secluded bays where small icebergs have run aground. 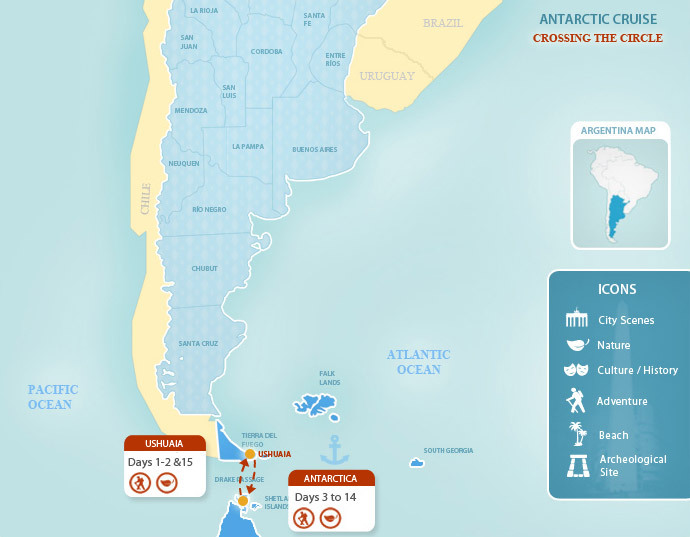 After almost two weeks at sea you’ll start heading north, back to Argentina and civilization. Be sure to spend some time up on deck to observe the impressive colors of the evening Antarctic sky, which can paint the landscape in incredible shades of rose and orange. Even during the day you may be surprised by the colors of this remote region. The green moss vibrates beside the rusty red lichens growing on rocks. Icebergs run the gamut from turquoise to purple in different light. The ocean appears inky one minute and as clear as glass the next. Opportunities for photography are extraordinary; be sure to bring a camera. Enjoy a final breakfast onboard and then watch as you approach South America, leaving the winterland wonders of Antarctica behind. One of our representatives will take you to the airport for your return trip. Alternatively, get your land legs back while exploring other Argentina travel destinations during an extended Argentina vacation.